Chocolate is not a flavor I feature here too, too often. Maybe because I do secretly love chocolate. 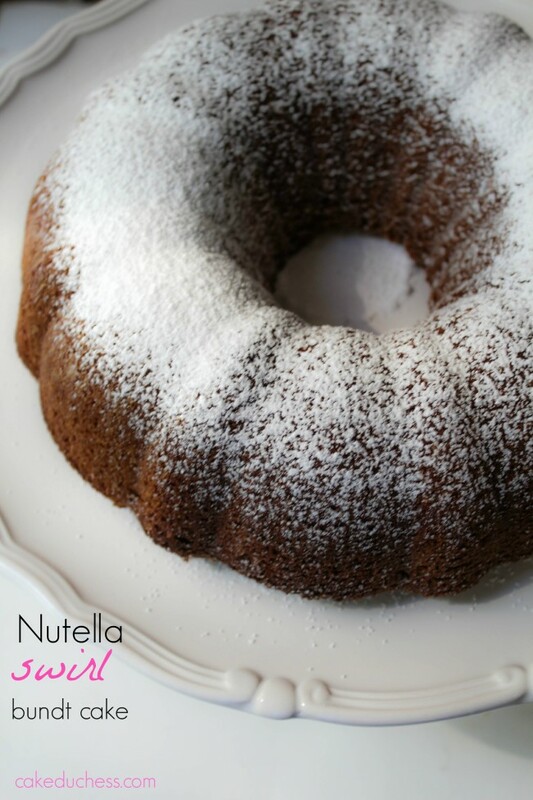 I do love this Nutella Swirl Bundt Cake very, very much! So when you secretly love something you have to stay away from it as much as you can. Avoid it like the plague. Run in the other direction as soon as you see something delightful made with chocolate. Some days it is just like that! I also have a little problem that I happened to give up chocolate for Lent. You may not see me posting chocolate here very often, but who’s to say that there isn’t a secret stash of very dark chocolate hidden in my fridge that is just for me. Now it’s still a secret because my kids don’t really read my blog. They do like to look at the photos. My mom does read it sometimes. Hopefully, today won’t be a day that she does. So I baked this right before Lent started. I was inspired by the gigantic jar of Nutella I had in my cupboard. It was beckoning to be used in a cake such as this one! I did bake this chocolate swirl cake before and it was a huge success and well loved by all! I subbed in Nutella instead of melting chocolate and I did use buttermilk instead of regular milk. What about those swirls?? I have some photos here on how you alternate the batters. You don’t know how the design will turn out until you bake it and slice it open. Some slices were more chocolate and some slices had an even distribution of vanilla and chocolate sections. I am more for it looking evenly distributed. I can tell you that there wasn’t anyone that complained about how even the portions of chocolate and vanilla were…there wasn’t one complaint!! 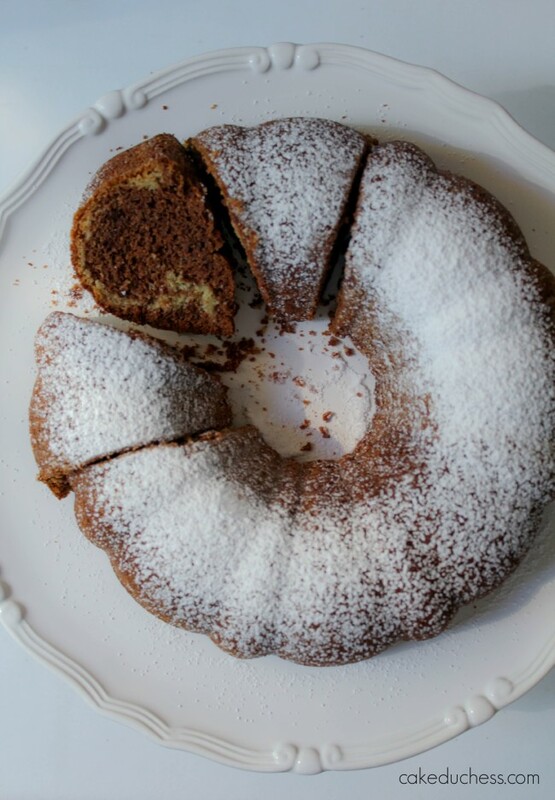 For those that are craving a little bit of chocolate and a really nice cake, this is your recipe!! It’s very easy to put together and the flavor is fantastic! 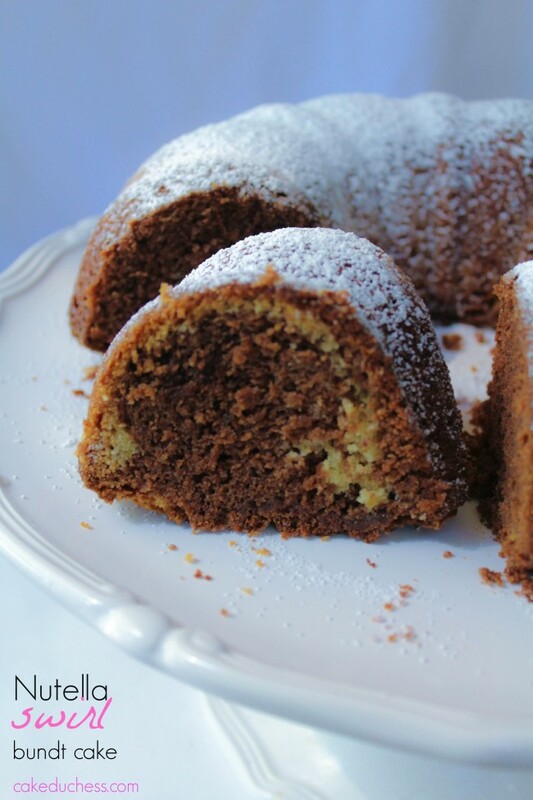 The texture is a bit firmer than other bundt cakes that I bake…almost like a pound cake. Nobody complained. If you don’t have any whole-wheat pastry flour, go ahead and use all-purpose. You will smile when you slice that first slice and see those gorgeous swirls!! In a large bowl, combine flours, powder, soda, and salt. In a small bowl, combine sour cream and 1/4 cup buttermilk. Add flour mixture and sour cream mixture alternately to butter mixture, beginning and ending with flour mixture. Stop mixture to scrape down the sides of the bowl with a spatula to incorporate all the ingredients. 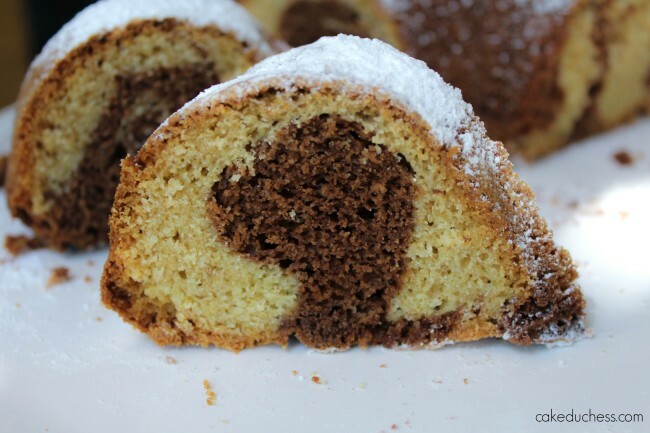 In a small bowl, stir together the Nutella, cocoa powder and the espresso. Remove 2 cups vanilla batter; add to chocolate mixture, and stir.